A singular Supercortemaggiore, 'Attenzione Richiesta A', service sticker. Sticker measures approximately 69mm x 77mm. All our service stickers are printed on matt vinyl so that they can be written on for that added authentic look. Agip 'Ciao Agip!' Servizio Service Sticker. 2.75". Pirelli "Calore" Red & Yellow Oval Stickers. 55mm Pair. Alfa Romeo Cloverleaf No Outline. 1.5", 4" or 6" Pair. 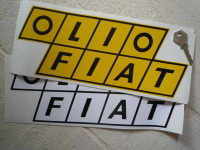 Fiat Barchetta Text Laser Cut Self Adhesive Car Badge. 6" or 9.5". Martini Racing Plain Body Stripe Style Sticker. 55.5" long by 0.75", 1.5", 3", 4", or 6" wide. 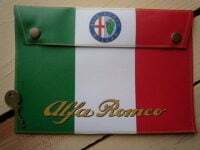 Alfa Romeo Serpent Logo Chrome Edged Style Sticker. 40mm.